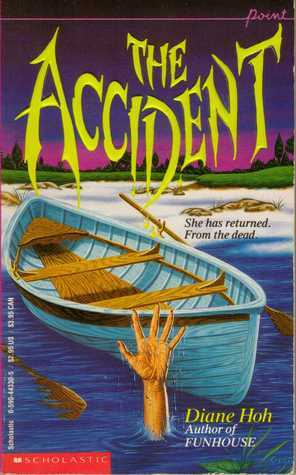 Inspired by Grady Hendrix’s Paperbacks from Hell, this new series of blog posts will highlight the 90s teen horror explosion. Get ready for neon covers, insane plot twists, and plenty of nostalgia! Count on young adult horror to take your enthusiasm down a notch. Car accidents, drunk driving, hitchhikers – getting your driver’s license suddenly became your worst nightmare. A group of friends, out joyriding, accidentally hit someone. Now they must make a secret pact not to tell anyone, because if anyone finds out, they might go to jail, or not get into an ivy league college. Sound familiar? It’s the plot of I Know What You Did Last Summer by Lois Duncan. While this story pre-dates the 90s by quite a lot (it was originally published in 1973), the movie firmly cemented this story in 1997. That’s right, over 20 years later! It’s also the plot of almost every other book on this list. 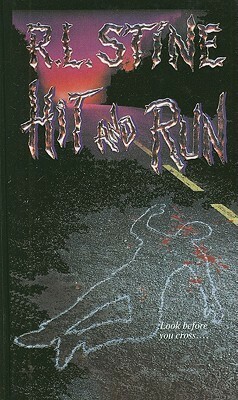 Like Hit and Run, one of R.L. Stine’s non-Fear Street books, written in 1992. Four friends, driving at night? Check. Someone dies? Check. The friends then make a pact not to tell? Check. Threatening messages afterwards? Check. In this case, it’s a man, not a boy on a bike, and the big reason they don’t go to the police is because they’re driving with permits. Lest you think the hit-and-run is limited to teens in cars, we have The Biker (1995), an entry in Diane Hoh’s Nightmare Hall series. Murder, blackmail – yeah, we’ve read this one before. The moral of the story is: traffic-related deaths do not have to result in a life-or-death pact between friends. There’s no turning back… they haven’t learned how to do three-point turns yet! Bad things happen when teens drink and drive, like hit and runs and MURDER! R.L. Stine’s Dead End (1995) exemplifies teenage irresponsibility, when Natalie decides not to get in the car with her drunk boyfriend and goes home with her friends, instead of oh, I don’t know, getting him home safely? 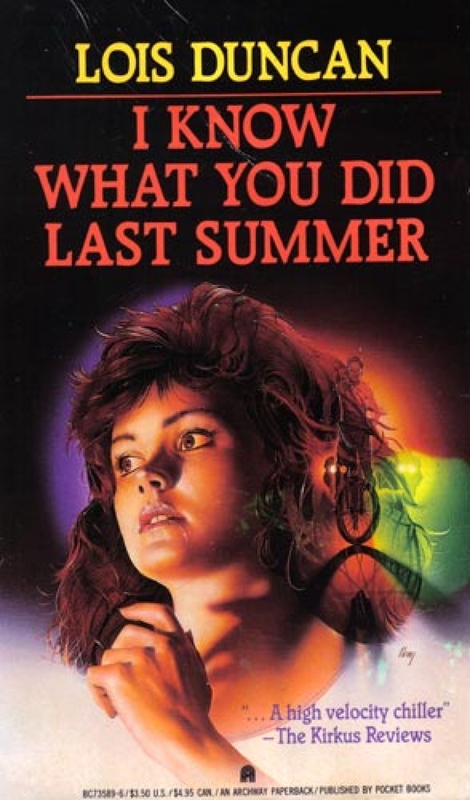 Instead, someone gets killed, and in true I Know What You Did Last Summer style, a bunch of the teen drivers/passengers decide not to go directly to the police. And then they start getting murdered. Um, sounds like every other book on this list so far. She has returned. From the dead. Despite the cover, this story starts off with a car accident. In Diane Hoh’s The Accident (1991), Megan’s three friends are injured in a car accident, after which Megan begins hearing the voice of a dead girl. 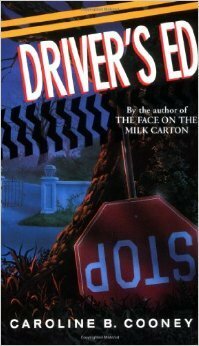 Count on Christopher Pike to take teen horror novels about driving to another level. And by another level, I mean purgatory. When you’re running away from home, of course you want to pick up not one, but TWO hitchhikers, both with weird-as-heck names. Poppy Corn and Freedom Jack? 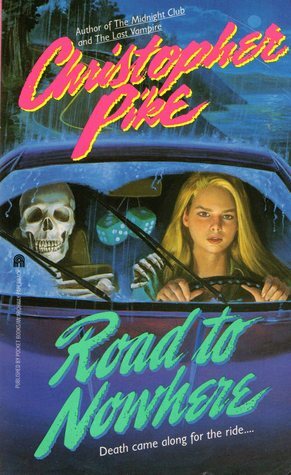 Road to Nowhere (1993) by Christopher Pike is only one of two novels he wrote that feature hitchhikers. Teresa’s highway to hell involving a lot of talking. Most of the story is Teresa, Free, and Poppy telling stories while they drive. There are a few choice destinations: about five mini-marts, a haunted castle where a psychic lives, and a church. I saw the end of this one coming a mile away, but guess what? The end doesn’t involve a pact. Just say no to mummified hitchhikers. Whisper of Death (1991) also features a hitchhiker on the cover, even though the story wasn’t really about hitchhikers at all. The characters do encounter a hitchhiker, who plays the role of portent. 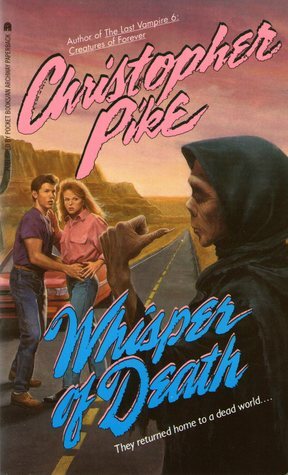 I had to include this one on the list, though, because Whisper of Death is one of my favorites, and has one of those classic Christopher Pike WTF plot twists. It also features a warning: don’t smoke at gas stations. Because you’ll die. My driver’s ed classes weren’t nearly this horrifying, unless you count parallel parking!